Ryanair, Poland’s No. 1 airline, today (16 Mar) announced a new Poznan base, its fifth in Poland, as it launched its biggest ever Poznan winter schedule (2017), with 1 based aircraft (an investment of $100m) and 7 new routes to Athens, Billund, Castellon, Eilat Ovda, Madrid, Oslo Torp and Tel Aviv, and extra flights to London Stansted (14 routes in total), which will deliver 500,000 customers p.a. and support 375* jobs at Poznan Airport. 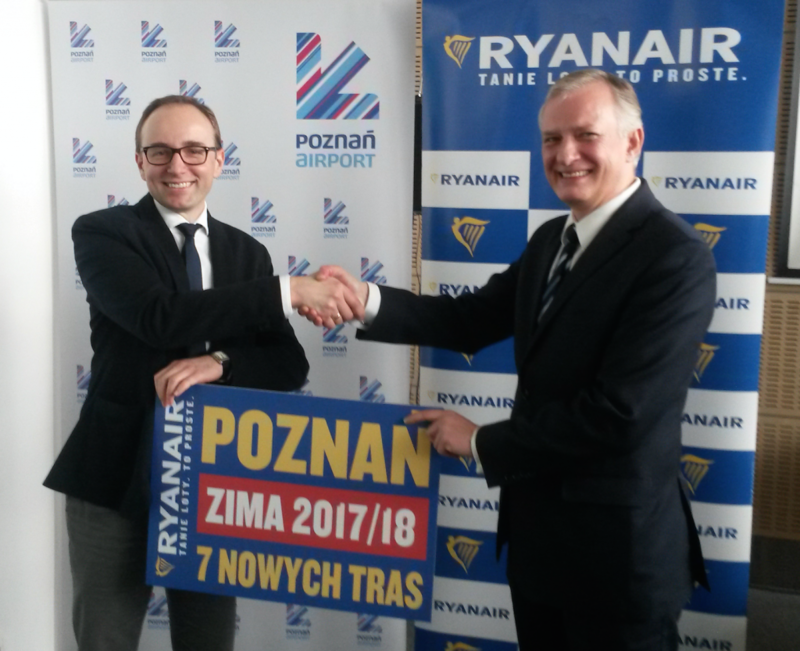 Ryanair will continue to connect Poznan with major business and leisure centres on high frequency, low fare services, including Dublin (3 wkly) and London (daily), with better timings and lower fares, making Ryanair the ideal choice for Polish business and leisure customers. Ryanair’s Poznan summer 2017 schedule is attracting record bookings, with more frequencies to destinations for summer family holidays including routes to Barcelona, Corfu and Malta, on lower fares as Ryanair passes on lower fuel costs, and an even better customer experience, as it continues to roll out its “Always Getting Better” improvements. “We are pleased to announce a new Poznan base, our fifth in Poland, as we launch our winter 2017 schedule, which includes 7 new routes to Athens, Billund, Castellon, Eilat Ovda, Madrid, Oslo Top and Tel Aviv, more winter flights to London and 14 routes in total, which will deliver 500,000 customers p.a. and support 375* jobs at Poznan Airport. Our based aircraft represents an investment of $100m, which further underlines our commitment to growing traffic, tourism and jobs in the Wielkopolska region and we look forward to working closely with our airport partners to deliver further growth in Poznan. These new flights will go on sale on the Ryanair.com website today. We are also pleased to report record bookings on our Poznan summer 2017 schedule and Polish customers and visitors can look forward to even lower fares, so there’s never been a better time to book a low fare flight on Ryanair. We urge all customers who wish to book their holidays to do so now on the Ryanair.com website or mobile app, where they can avail of the lowest fare air travel to and from Poznan.